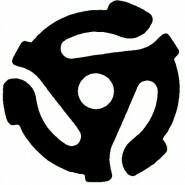 You know, the thing that they used to put in the centre of the records (45s to be exact) to allow you to place them on your record player. I saw one on a radio station advertisement recently and immediately thought “How clever? !” I didn’t have to think twice about the music the station played; that ‘do-hickey’ immediately conveyed a time and place in the last century making it instantly recognisable and appreciated by its demographic. My next thought was “Oh s*%!, I’m that demographic”, and I looked around the bus and started to wonder whether any of the young’ns with their iPods cocooning them in an anti-social bubble of sound and their smart phones tearing their attention away from the world passing by would actually know what that do-hickey was? Change is constant. Age is relative. I’m sure there are plenty of people that see me as a young ‘whippersnapper’. I don’t say that as a consolation. I certainly don’t believe that youth has the market cornered on embracing life. Quite the contrary, I extol the virtues of challenge and that is subjective to personality not governed by age. There’s a great ad for underwear that ran in Australia a year ago. (See below). Again, I thought it was an incredibly clever ad that compared two different generations of men and having them both not understand the other, but walking a line that neither was right. Or at least that’s how I interpreted it – perhaps because I sit between the two generations portrayed in the commercial I found myself laughing (good humouredly) laughing at both groups of men. Got any funny anecdotes of Generational Differences you’ve recently encountered? Please share!